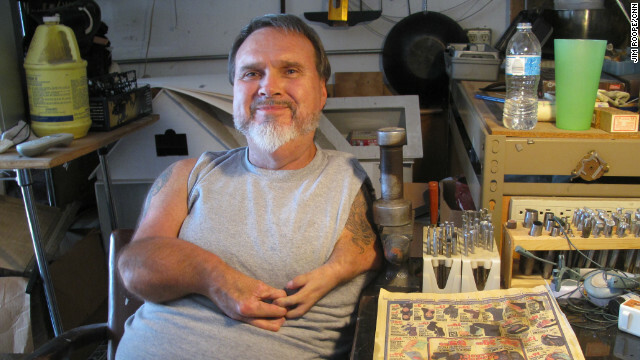 Jack Merica’s arms and hands are underdeveloped due to the anti-morning sickness drug thalidomide that his mother took while pregnant with him in the late 1950s. (CNN) - Jack Merica’s mother suffered from severe morning sickness and a history of miscarriages. When she was pregnant with him in the late 1950s, the morning sickness came back. Concerned that her symptoms could bring on another miscarriage, she went to the doctor. To fight the sickness, she was given the experimental drug thalidomide. Merica was born with asymmetrical-bilateral phocomelia, a condition in which the upper part of an arm or leg is under-developed or non-existent. His left arm is 16 inches from shoulder to fingertip and his right arm is 28 inches, shoulder to fingertip.